Filtrex has developed its ACB filter to be handy, environmentally acceptable and cost effective. The ACB is a tailored solution that will fulfill the current and future requirement in sea water filtration. This is possible thanks to Filtrex considerable commitments to research, design and resource optimization. No other filter on the market is able to match or even come close to the performance of the ACB® filter for operation with high TSS, reliability, filtration and backwashing efficiency, durability, easy operation and maintenance. Since 1982 FILTREX has installed worldwide thousands of filters with the same operating principle. The filter operates continuously, with a precise filtration degree (down to 6 μm). The armoured filter element is made of stainless steel and is able to withstand high differential pressures without problems. 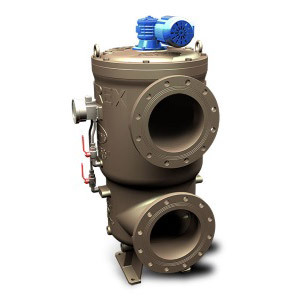 The filter body and internal parts are built entirely of bronze-aluminium alloy ASTM B148C95800 with a strict quality control system, approved by all major classification organizations. Ability to operate with high TSS. Compact dimensions in both height and footprint, even in the presence of the backwashing pump, that is directly connected to the filter. The bronze aluminium construction guarantees a high durability, even with improper maintenance. No need for painting, which may get easily damaged. Simple: made of a few elements for easy, fast and accurate maintenance. High regeneration capacity of the filter element, in just a few seconds. Long service life of the filter element. Great filtration efficiency (up to 6 μm). Completely manufactured by Filtrex in the Milano (Italy) factory. New application of an established technology with proven experience.